Investorideas.com - Is Litecoin Just a Testnet for Bitcoin or a Vastly Undervalued Cryptocurrency? 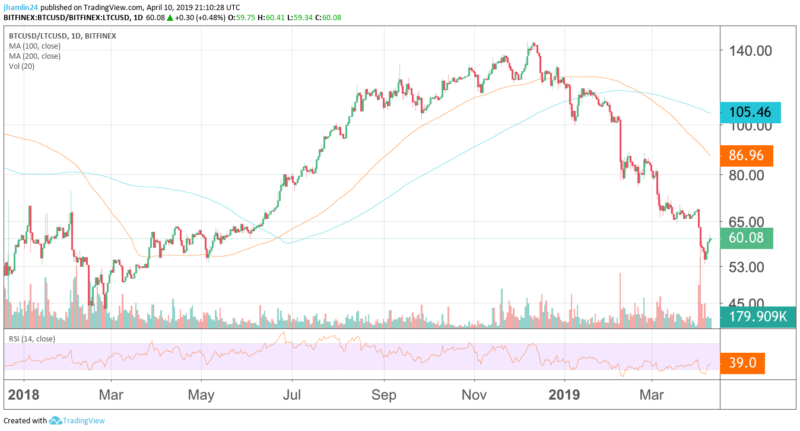 April 11, 2019 (Investorideas.com Newswire) Jason Hamlin of Gold Stock Bull discusses the cryptocurrency Litecoin and whether it has value as a standalone currency. I read a critique on Litecoin recently. The basic premise was that Litecoin is just a testing ground or testnet for Bitcoin. The author seemed to insinuate that Litecoin had little value other than testing new technologies prior to Bitcoin implementing them and was not a valuable standalone cryptocurrency. Mike Novogratz also chimed in recently, calling Litecoin a "glorified testnet." Therefore, many investors believe that Litecoin is currently overvalued relative to Bitcoin. I would argue the exact opposite case. In fact, I made this precise argument a little over a year ago and the Litecoin price advanced over 500% in the six weeks after the article was published. Meanwhile, the price of Bitcoin "only" advanced by around 150% in the same time period. So is Litecoin still undervalued relative to Bitcoin? First, let's cover the basics. Litecoin was deployed on GitHub on October 7th, 2011. This was roughly 20 months after the launch of Bitcoin. 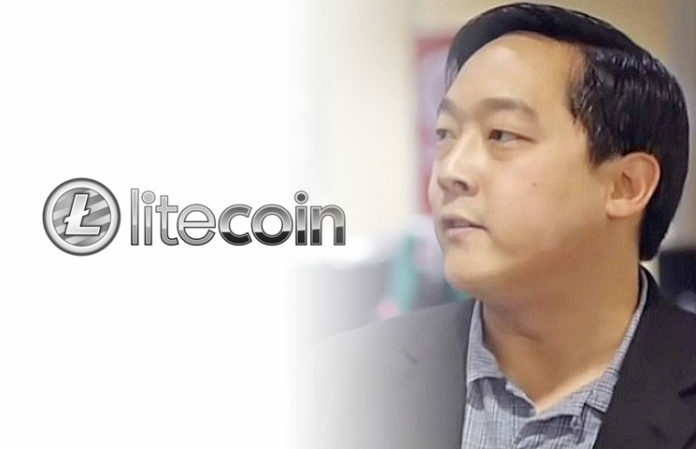 The developer behind the Litecoin platform was Charlie Lee, a former Coinbase engineering director and a Google employee at the time. Litecoin is a hard fork of the Bitcoin Core client with some key modifications. Namely, Litecoin has a slightly modified GUI, an advanced scrypt hashing algorithm (instead of SHA-256), an increased maximum number of coins, and a lower block generation time of 2.5 minutes (vs. 10 minutes for Bitcoin). One way to look at the valuation is comparing the supply of each token. There will only ever be 21 million Bitcoin and 84 million Litecoin created. The supply of Litecoin is 4x the supply of Bitcoin, so we might expect the price to be somewhere in the general vicinity of 1/4 or 25% of the price of Bitcoin. With Bitcoin around $5,000, this would put the target value of Litecoin at $1,250. Yet, it is currently trading at just $80. The upside potential, assuming the Bitcoin price stays flat, is 15.6x or 1,460%! We expect the Bitcoin price to rise substantially over the next few years, so the upside for Litecoin could be even higher. I view the downside risk to the price of Litecoin at around 50% in the short term. So, we have upside potential of 1,460% and downside risk of 50%. That is what I would call an asymmetric trade. Of course, this is an oversimplification there are other factors that we need to consider. Volume/Liquidity: Bitcoin has trading volume of $14 million per day and Litecoin is currently around $2.6 million per day. Inflation Rate: Bitcoin is currently inflating at 3.8% annually. This will drop to just 1.8% with the next halving event in May of 2020. Litecoin is currently inflating at 8.9% annually. This will drop to 4.2% with the next halving event in August of this year. Performance: Litecoin is faster than Bitcoin at confirming transactions. On average, it takes Litecoin just 2.5 minutes to confirm a transaction compared to 10 minutes for Bitcoin. With the implementation of Segwit on both networks and availability of the Lightning Network add on, fees are just pennies and transactions times can be reduced to a matter of seconds. Litecoin also has some technological superiority compared to bitcoin. 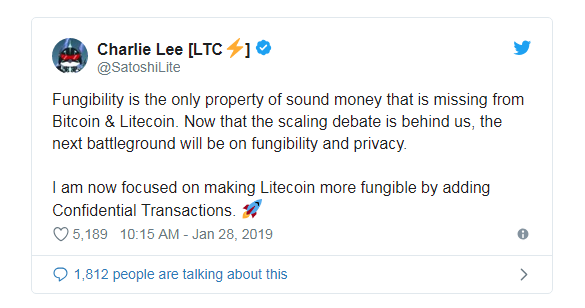 The Litecoin Core Developers have begun plans to implement Confidential Transactions in order to improve privacy and address fungibility issues. Confidential Transactions work by obfuscating the amounts being transacted over the network but not where the coins are being sent. Litecoin is also investigating MimbleWimble and Extension Blocks for increased scaling and privacy on the network. Brand Equity/Trust: There is also the question of the brand. The equity of a brand is determined by a multitude of factors. A few of the top ones that come to mind are how long the network has been around how often has it been hacked. Also, how trustworthy are the founders, was the token pre-mined, is there an unfair or centralized governance model? Bitcoin undoubtedly has the greatest brand recognition and enjoys first-mover advantage. But Litecoin was the second cryptocurrency launched after Bitcoin and it is accepted almost everywhere that Bitcoin is accepted. Litecoin trades on every major exchange with a significant number of trading pairs. It is one of only a handful of cryptocurrencies that can be stored on the popular hardware wallets and it can be bought and sold at thousands of ATM locations across the globe. Litecoin also has a strong and active community. Tens of thousands of people actively promote Litecoin and participate in the ecosystem. Litecoin was not pre-mined to enrich the creators and is somewhat decentralized. Charlie Lee has stated that he will step away from the project eventually, in order to make it even more decentralized. People often refer to Litecoin as silver in relation to Bitcoin as gold. Creator Charlie Lee sees Bitcoin and Litecoin as complementary assets. Bitcoin is better as a store of value and Litecoin is better for smaller everyday transactions. Bitcoin proponents might argue that the introduction of Segwit and the Lightning Network make Bitcoin viable as a transaction layer as well. The analogy puts Litecoin in the same class a Bitcoin, just at a lesser value. And that lesser value, if you were to try to calculate it, would probably be a lot closer to 1/4th the price of Bitcoin than where it is now at 1/60th the price of Bitcoin. Litecoin has outperformed Bitcoin by a wide margin in recent months. 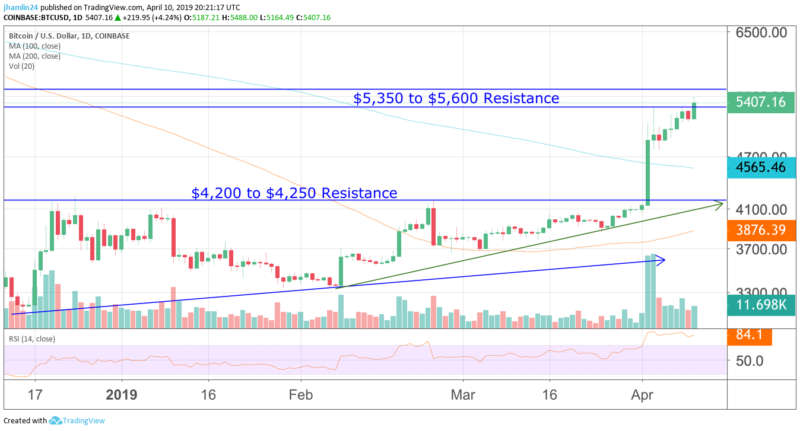 Bitcoin is up from the low of $3,150 to the current price of $5,400 for a gain of 71%. 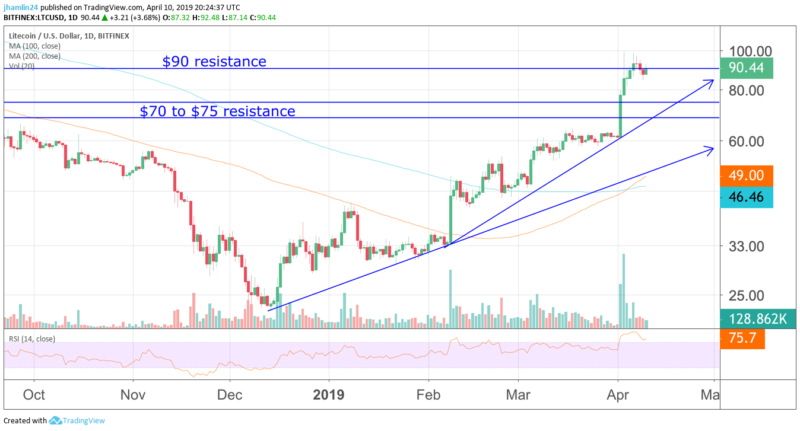 In the same time period, the Litecoin price has advanced from $23 to $90 for a gain of 391%. The Bitcoin-to-Litecoin ratio has dropped by more than half in the past few months. It has fallen from a high above 140 to the current level of 60. This might make Litecoin appear overvalued relative to Bitcoin in the near term. But this ratio was below 45 several times in the past and it is still a long way from the supply ratio of 4. A major catalyst for Litecoin outperforming is the upcoming halving. This is when the Litecoin block mining reward halves every 840,000 blocks. In this case, the coin reward will decrease from 25 to 12.5 coins. As mentioned above, this will reduce the inflation rate of Litecoin from 8.9% to 4.2%. I know it's a hard concept to grasp, when there is a slowing of the rate of supply growth in a currency and a maximum supply, as this does not exist with central bank fiat money. But the digital scarcity of Litecoin and Bitcoin is a key factor in the attributed value of the tokens. I suspect that we will continue to see Litecoin outperform other top cryptocurrencies until the halving event occurs. At this point, investors may shift funds towards Bitcoin, which will be next to halve its block reward in May of 2020. The rate of supply growth for both Litecoin and Bitcoin will continue to slow until they hit their maximum token levels. At this point, no new Bitcoin or Litecoin will be created. As adoption and demand increase and the supply growth slows toward zero, the fundamental law of supply and demand dictates higher prices. While many people like to choose and a side and argue the merits of one cryptocurrency versus another, the choice is not binary. We believe both tokens will generate significant returns for investors in the year ahead and that cryptocurrencies will completely disrupt the antiquated financial system. So, we hold both tokens in our model portfolio, along with another 5 to 10 highly prospective tokens backed by blockchain firms that are pushing forward major innovations that were not possible just a few short years ago. 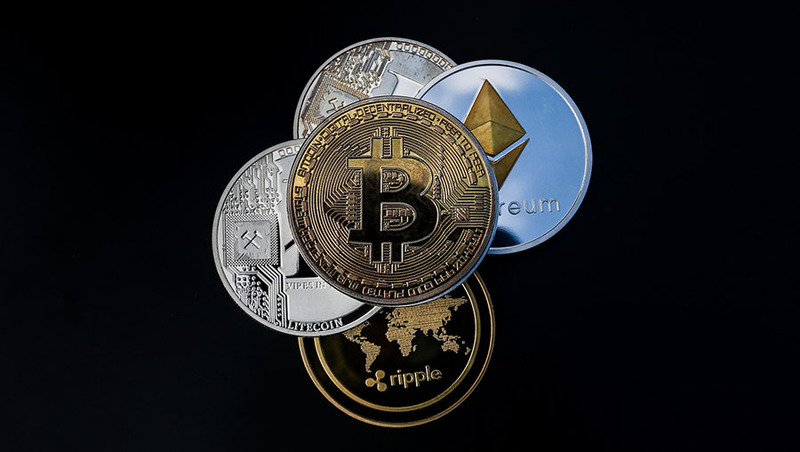 The pace of change is accelerating and the gift of cryptocurrency and blockchain technology that Satoshi Nakamoto brought to humanity is still in the early innings. If you would like to be first to receive Gold Stock Bull's research and investment ideas, sign up here.